This spectacular property measures 6 acres and features a spectacular view, 3 very spacious residences and has a rolling topography for potential future development. The property stands over a high class area of the Central Valley in the mountains of Barba, Heredia and is very accessible to all local services. This spectacular Mountain View villa features beautiful well maintained gardens and it is strategically located for you to enjoy outstanding views over the central valley towards the Gulf of Nicoya. Don’t miss this unique opportunity to obtain one of the nicest Quintas in the Central valley. 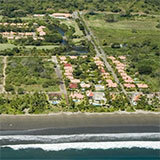 Give our real estate office in Costa Rica a call today! !